Secondary ticket markets are rising in popularity, interfering with what is supposed to be a fun experience for our loyal patrons. 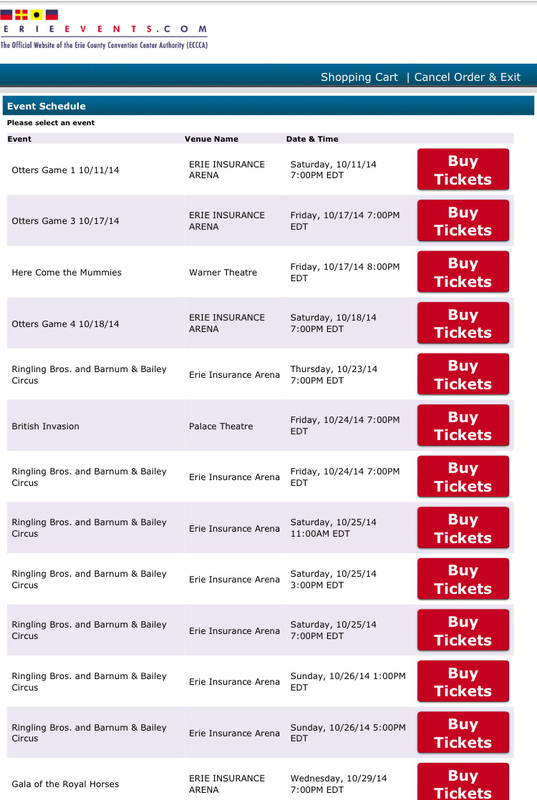 We want buyers to use caution when purchasing tickets to events at Erie Insurance Arena and the Warner Theatre. The only safe place to purchase tickets is by visiting the Erie Insurance Arena box office, the official website for Erie Events, or by phone. Patrons will avoid higher prices and eliminate the possibility of purchasing tickets that aren’t valid. The problems of secondary ticket markets became more evident during the Jason Aldean: Burn it Down tour that sold out Erie Insurance Arena in October. In an effort to minimalize the actions of these markets, the show promoter required the arena to hold tickets purchased through the Fan Club pre-sale at the box office and only the original buyer with appropriate ID would be allowed to pick them up. Ticket resellers, who were informed of this policy, gave their customers misinformation and many fans found themselves without tickets. Unfortunately, the Erie Insurance Arena could not help these fans because their ticket transaction did not occur through the box office. These situations will be on-going as promoters and artists introduce new measures to keep secondary ticketing companies from gouging their fans. Procedures like those for the Jason Aldean pre-sale, where tickets can only be picked up by the original purchaser, will continue. Many artists have also established stricter ticket limits on the number available to purchase which limits the amount available to resellers. Erie Events’ has a longstanding policy of an eight ticket limit, although some shows have reduced that to four, or even two per person. So how does a show like Aldean’s sell out ten minutes after going on sale? The demand for tickets greatly exceeded the number that were available for sale. Thousands of tickets were allotted to the Fan Club and radio pre-sales and all sold out within minutes. The public on-sale, which occurred via the phones, internet and box office simultaneously, also sold out within minutes. With computerized ticketing, every person on the internet is essentially, the first person in line at the box-office window. Erie Events’ is not able to honor, replace or refund invalid tickets. Customers with invalid tickets are welcome to purchase replacement tickets from us, but seating location and/or price is based upon availability. Some resellers may offer money-back guarantees, but that does not necessarily guarantee entry to an event. Unfortunately, there is no way to determine if the person buying a ticket is purchasing it for the secondary ticketing market. Therefore, it is not possible to stop those buyers from purchasing tickets. It’s up to us to educate our patrons to be cautious when purchasing tickets. The buyer must beware. In the best interest of our patrons, we offer this simple advice: the only guaranteed ticket is purchased at the box office at the Erie Insurance Arena (where there are no handling or service fees), by purchasing through our website (www.erieevents.com) or by calling the box office at 814-452-4857.